These days grocery stores sometimes have some amazing bakeries. If it’s a real bakery — and for some reason California grocery stories — even a Safeway — have a lot of great bakeries with freshly made bread, rolls, bagels, breadsticks and of course breakfast pastries daily. I always try to get the best breads for our veggie burgers, because after all, you’re dealing with reduced expectations in your burger-eating friends. They have already decided the content of a burger needs “real meat” to taste good. So I go overboard to make veggie burgers that blow their minds, complete with melt-in-your-mouth ripe tomatoes, chopped lettuce, red onion, avocado slices, Morningstar Buffalo chickenless (tastes like Buffalo chicken flavor) patties or another good variety of veggie burger, vegan mayonnaise “Just Mayo” from Hampton Creek — delicious! — plus ketchup and sweet pickles. And of course there is the bread. The bread is everything in a burger. Don’t use those tasteless gummy hamburger rolls sold in plastic bags, go for freshly baked ciabatta rolls from a bakery – the ones you pick out with tongs from bins. It’s worth it. So I had an extra ciabatta roll left over from yesterday’s veggie burger blowout and used it to make panzanella. The roll was getting a bit hard because I deliberately left it out overnight to get hard, which is what you want for panzanella, a Tuscan salad. 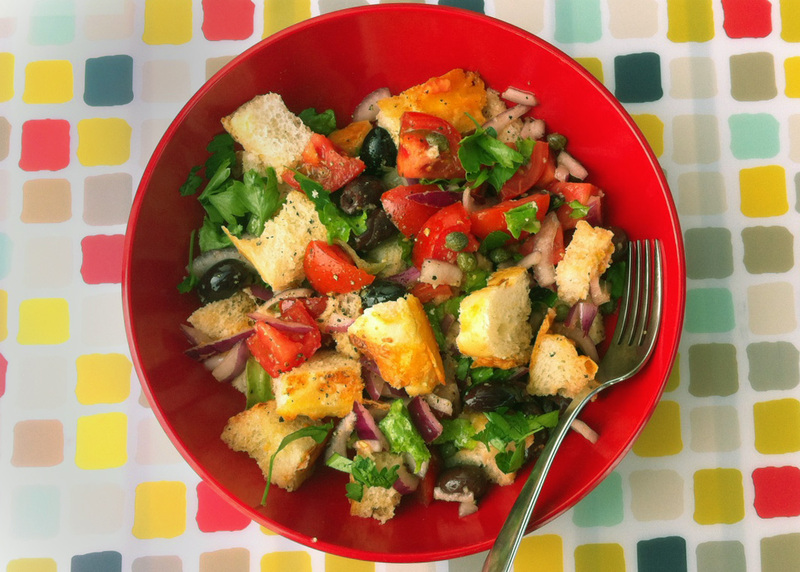 Basically you just take juicy ripe tomatoes, olives, garlic, capers, red onion, parsley, cukes, and a small amount of olive-oil-red-wine-vinegar vinaigrette and add them to the day-old cubed leftover bread, let it sit for an hour to soak up the juices, then preferably dine al fresco! This salad is like a deconstructed bruschetta. A great hot weather or minimalist dinner, no cooking needed. Lotsa flavor. Lotsa compliments. But remember, THE BREAD AND THE TOMATOES ARE EVERYTHING. Don’t try this with anything but the best bread and the best tomatoes. Put everything in a bowl and toss gently until all the pieces are lightly coated. Allow to sit at room temperature for at least 15 minutes to let the flavors blend. The staler the bread is, the longer you’ll want to let it sit — up to an hour. Serve with a nice glass of red table wine. Imagine yourself sitting at a sidewalk bistro in Tuscany, as the cobblestone streets turn golden from the setting sun. This recipe was adapted from the book “Easy Vegetarian” by Ryland, Peters and Small of London.